Perfection’s Randy Clemmons named 2016 Craft Professional of the Year! 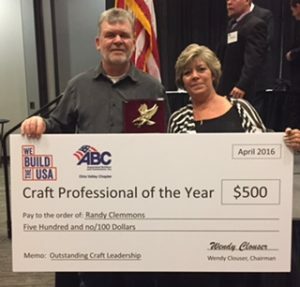 We are proud to announce that our own Randy Clemmons was named 2016 Craft Professional of the Year by the Ohio Valley Chapter of Associated Builders and Contractors, Inc (OVABC) on April 12th. Randy was recently promoted to Superintendent in our Mechanical Division and has worked at Perfection for 8 years. Randy has excellent communication and organizational skills and is extremely qualified in his craft. He has been an instructor for OVABC and a trainer for Perfection. He is a certified welder, licensed plumber and is back flow and rigging certified. He is a great asset to the Perfection Team and we are very proud of Randy for winning this prestigious award!